Plenty of pitching power in compact form. Solid Boss compact pedal construction. Decent price. Nice range of pitch/harmonic effects. 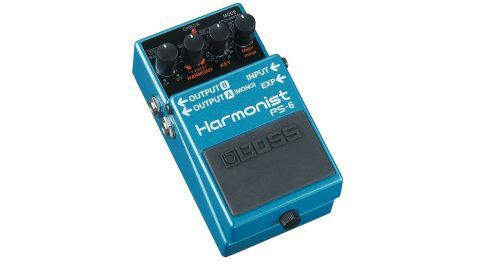 Boss' PS-6 offers major and minor harmonies, pitch shift, detune and the Super Bend effect, which delivers pitch sweeps. "You can tastefully blend in an octave up for a 12-string effect"
These are triggered by holding the pedal switch down or controlled, Whammy-style, by adding an expression pedal. The Pitch Shift function supports a variety of intervals, as does the set-by-key Harmony. The balance knob sets the blend between dry and pitch-shifted signal, so you can, say, tastefully blend in an octave up for a 12-string effect. A compact choice delivering a tasty range of musical pitch effects to your 'board.